The grammar of the language can't be deduced from an appeal to "logic", but must be discovered by examining practice. In reviewing my list of new-to-me terms, I find a lot of them to be kind of depressing. So let's concentrate on a couple of boat-related terms. In other words, canoe politics is a form a governance by compromise. Ok, maybe I'm a little depressed even by this. Solution: more boats. The second new-to-me term is kayak problem. This comes from Steve Krug's excellent book Don't Make Me Think, which is about web usability—i.e., how to create user-friendly computer interfaces. Krug notes that with some designs, at least some users will have a problem. As an example, if you're designing a menu system, do you put Preferences under File or under Tools? Some users will first guess File, others will first guess Tools. He calls this a kayak problem because if you roll over in a kayak, the kayak quickly rights itself. Similarly, if the user can quickly recover and find the right path, it is a problem, but not a serious one. So there you have it: a kayak problem is one that's easy to recover from. 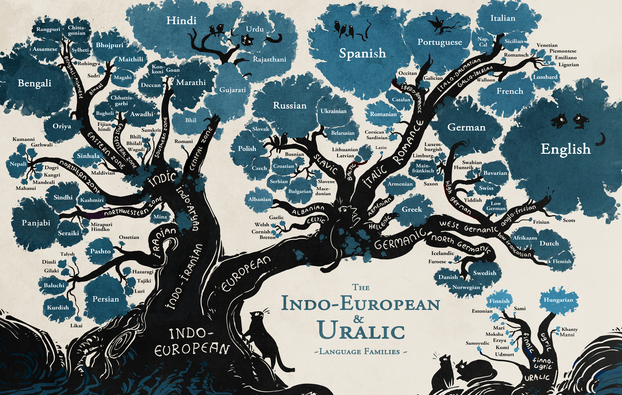 The poster shows the common trunk and branching for Indo-European languages (Hindi, Persian, Greek, Latin, Germanic, Russian, Celtic, and many more) and of the Uralic languages (Finnish, Hungarian, and others). While we were admiring the poster, someone asked, "Where's Arabic?" Ah, it was explained, that's a Semitic language, hence not represented here. During the subsequent discussion, someone asked "Where does the name Semitic actually come from?" Good question. The Semitic languages are in a family of tongues spoken originally around the Middle East: Arabic, Hebrew, Amharic (spoken in Ethiopia), Tigrinya (also in Ethiopia), and others. Historically, Assyrian, Aramaic (spoken during the time of Jesus), and Phoenician were also Semitic languages. (Fun fact: The Carthaginian general Hannibal, the almost-defeater of Rome, spoke a Phoenician dialect, hence the Punic Wars.) But again: why do we call them Semitic languages? The relationship between Arabic, Hebrew, and some other languages has been recognized for a long time. In 1781, August Ludwig Schlözer, a German historian, assigned the name Semitic to a certain set of these related languages. Influenced by the Old Testament, Schlözer thought that the people who spoke these languages were descendants of Shem, the oldest son of Noah, as described in Genesis 10 and 11. 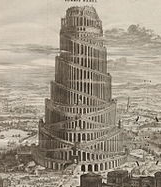 (Ham and Japheth and their descendants were thought to have been the origins of other language families.) Schlözer was somewhat right in that he got Hebrew and Arabic into the same family. But he really wanted to (incorrectly) add unrelated languages to the family because he viewed their speakers as other descendants of Shem. In spite of this confusion of ethnology and philology, his name stuck for the language family. It's not the only time that some mistaken notions about names were immortalized for posterity. Which continues in some quarters (example).